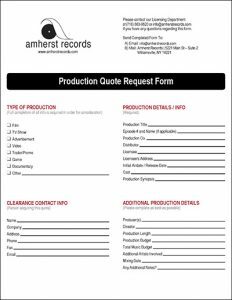 Amherst Records is a great source for all of your audio production needs. Our music can be licensed for use in films, TV shows, commercials, videos, games and more. Find the music you need from our artists, then connect with us to assure the perfect soundtrack. If a visual performance, who's performing on camera? Is this proposed fee on a Favored Nations basis with all songs/maters licensed? BMI is the bridge between songwriters and the businesses and organizations that want to play their music publicly. As a global leader in music rights management, BMI serves as an advocate for the value of music, representing more than 8.5 million musical works created and owned by more than 650,000 songwriters, composers and music publishers. HFA is the leading provider of rights management, licensing, and royalty services for the U.S. music industry and was established in 1927 by the National Music Publishers’ Association (NMPA) as an agency to license, collect, and distribute royalties on behalf of musical copyright owners.